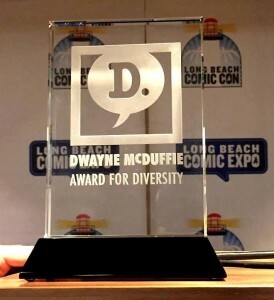 On February 18, at a ceremony held at the Long Beach Comic Expo, the graphic novel series “Upgrade Soul,” a science fiction story about an elderly couple who undergo an experimental procedure to rid themselves of their toxins on a molecular level with unforeseen consequences, by writer/illustrator Ezra Claytan Daniels, won the third annual Dwayne McDuffie Award for Diversity in Comics (DMAD). The other nominees included Shaft: Imitation of Life by David Walker and Dietrich Smith; Amazing Forest by Ulises Farinas, Erick Freitas, and more; StarHammer by J.N. Monk and Harry Bogosian; and 14 Nights by Kristina Stipetic. 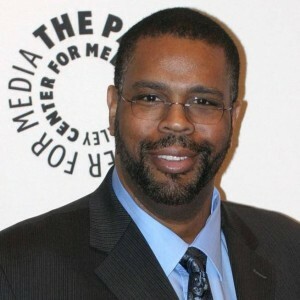 The award is named after prolific comics/animation writer and champion of minority representation Dwayne McDuffie, who passed away on February 21, 2011, at the age of 49. Despite his groundbreaking work writing many iconic superheroes for TV shows such as the Justice League and Static Shock, there remain those unaware of McDuffie and his influence on the industry. A few years ago, the idea of the DMAD was suggested by friend and colleague Neo Edmund to McDuffie's widow Charlotte Fullerton, also an animation writer, as a way of continuing his legacy and spotlighting diverse content and creators. Each year, a selection committee for the DMAD is convened, made up of comic professionals with values consistent with McDuffie's own. This year's panel of judges included Mark D. Bright, Edmund, Joan Hilty, Joseph Illidge, Heidi MacDonald, Don McGregor, Kevin Rubio, Cassandra Pelham, Gail Simone, Will J. Watkins, Matt Wayne, and Len Wein. Though the DMAD has only been up and running for a few years, it has been gaining wider recognition. This year saw more than 115 submissions for award consideration, a 35 percent increase from 2016 and 80 percent more entries than its first year, in 2015. DMAD director Will J. Watkins attributes this to a growing reader interest in diversity both within and behind the comic book panels and a reflection of a changing world. The motto of the DMAD is “From invisible to inevitable,” and everyone involved in the award has clearly taken it to heart. Despite the progress that has been made in racial diversity throughout the comics industry, there is still a segment of the audience whose back goes up whenever these issues arise. Some see the change as proof of creators trying to force their political and racial agendas down readers' throats. MacDonald (editor in chief of the blog “The Beat” and DMAD judge) says she observes that many commentators claim an "agenda" whenever comics do not feature a white male hero. Yet MacDonald argues that the benefits of diverse comics far outweigh the complaints of a vocal few. "Comics sales have grown steadily for years, and that is obviously because more books are aimed at female readers and other nontraditional comics reading groups, and there are more outlets that cater to more customers."